While news broke that the Atlanta Braves went ahead and signed Josh Donaldson to a one year deal worth $23M, the Mets made a transaction of their own. They claimed Jordan Patterson, a left handed outfielder with some pop, off of waivers from the Colorado Rockies. Patterson, an Alabama native, may end up being a piece added for minor league depth, but at the age of 26, he needs to find a role on a Major League team before he may be forced to play overseas. But let’s take a look at who Jordan Patterson has been till today’s claim. Patterson was drafted in the fourth round in the 2013 June amateur draft and appeared in 10 games for the Rockies in 2016. He only had 18 at-bats with Colorado and had 8 hits, one of which was a double and he drove in batters. He put up a .444/ .474/ .500/ .974 slash line along side a 145 OPS+ in his extremely small sample size, 3 years ago. In six Minor League seasons, Patterson bat .285/ .365/ .504/ .869 with 107 home runs, 163 two baggers, 28 triples while driving in 407 RBI’s in 2471 accumulated at-bats. He also stole 72 bases and got caught 31 times. I don’t see Patterson getting much time at first or the outfield as a potential starter but his versatility is perfect for a player to come off of the bench and pinch hit, then be used as a defensive replacement via double switch. 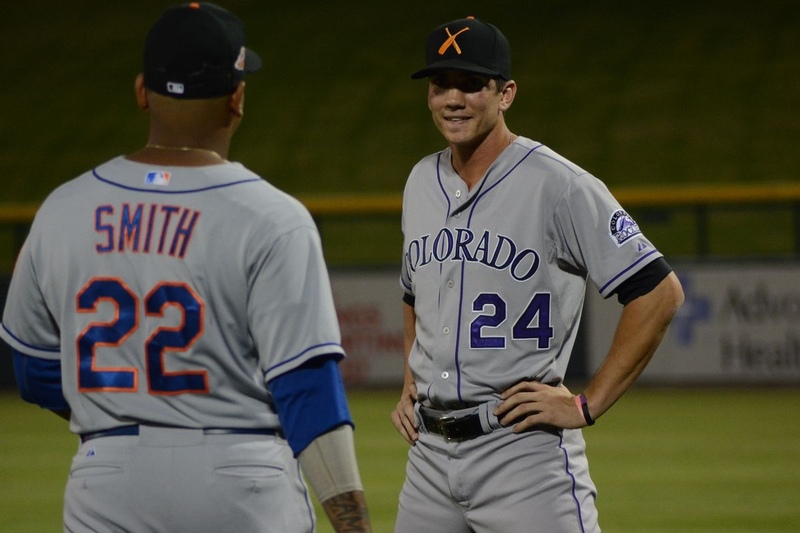 Rhonda’s Roundup: I think this move will definitely benefit the Mets and Jordan Patterson. Patterson is 26. The Rockies never fully had given him an opportunity to show what he is capable of doing. So if he may or may not take a year or two to break out and come into his own is one thing. He has the age going. It took Stars like Justin turner and Daniel Murphy a while too before they had a stellar season or two then everyone was shocked. It’s important to not rush Patterson as the expectations should be set normal. First base would be an excellent place for him to develop into the player fit for an organization needy of solid and productive players. Expect his first season to be one if learning. In the second year Is where the Mets may know if this move was worth it or not. Del’s Deal: Jordan Patterson is a big lefthander with above average power (50 grade). He needs to improve on shortening his swing, lowering his strikeout rate, and drawing more walks before he could be an everyday player at the MLB level. Patterson is a great depth piece for the Mets to have especially with their history of injuries. His arm is rated at 60 Grade and his fielding is at 50 which makes him an above average defender. He’ll likely start at AAA with occasional callups when needed at 1B/RF. Huge loss for the Rockies who have logjam of 1B and corner OF and nowhere for Patterson on the 40-man roster. Good move Mets!